We’re getting close to the grand finale folks! I started my weight loss challenge against Paul Piotrowski nearly 4 months ago, which means that there are only 4 days left! This will be the last weight loss update before the final results post which will be published in a week from now. 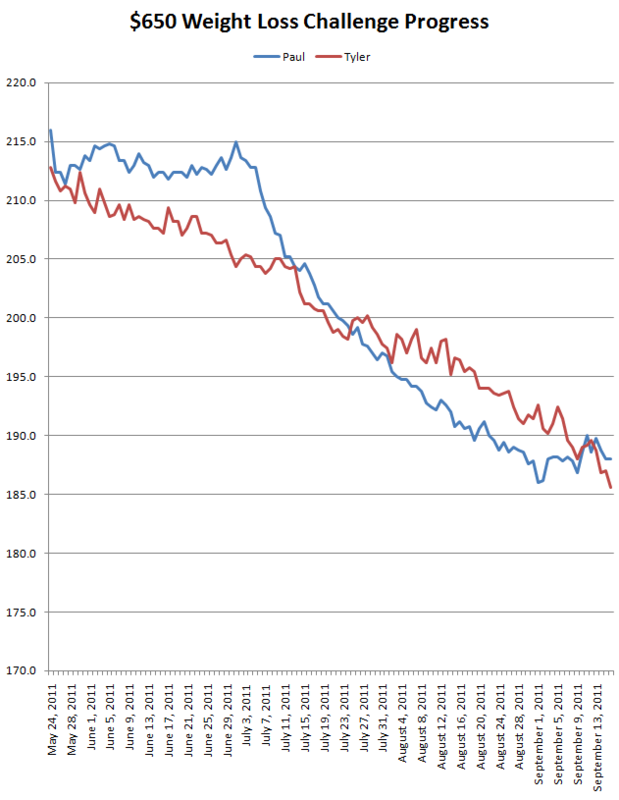 Those of you who have been following this challenge will probably be surprised by the graph above. Paul had been absolutely creaming me in the challenge shortly after he started his Dr. Bernstein diet in the beginning of July, and actually made his target weight on September 1st. But going to the clinic 3 times a week to pee in a cup and take vitamin-B injections quickly became too costly at $600 a month, so Paul only stayed on the diet for 5 weeks before switching over to their reduced ‘maintenance’ program in the second week of August. He continued to lose weight at a good pace, but slowly his weight loss slowed down… plateaued, and then actually started to turn into weight gain. 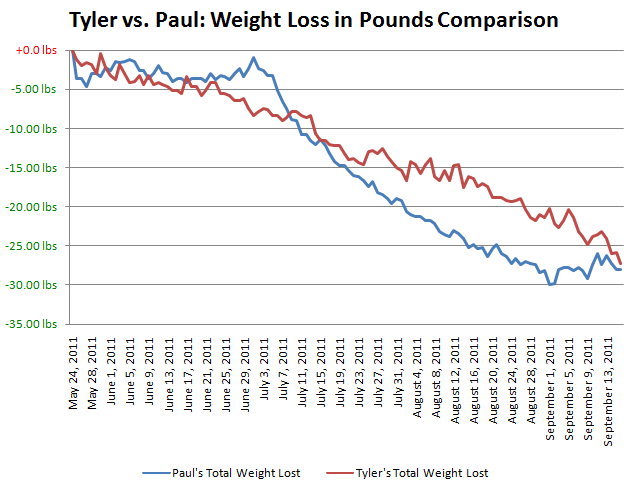 Paul will likely say that this weight gain is due to his recent working and focusing on his new website, but that’s really not an excuse. I believe the truth is that Paul is similar to me in that we have a kind of “all-or-nothing” attitude; we’re either a level 1 or a level 10, and we find it difficult to find the balance between 4-6 (or even 3-7). Therefore, Paul did awesome while on his extremely strict diet because he was 100% (level 10) focused on it. But very shortly after going off it, he started to plateau and then gain weight because he wasn’t as focused. As you can see from the graph above, I’ve kept a very consistent and gradual rate of weight loss. I have the standard spikes and valleys here and there, but for the most part my weight loss could be drawn with a diagonal line. During the past week or two, Paul has been totally pigging out indulging in unhealthy, high-calorie foods such as: pizza (thick crust, non-vegetarian), pasta, perogies with smokies and bacon, and McDonalds. So, I have absolutely no sympathy for Paul’s recent gain. See, I love food… I just love to eat tasty food. Not everyone loves food, but I do. And so for me it has been real struggle to completely cut out all fast food, pop, unhealthy foods, restaurants, etc. Paul was on his diet for about 5 weeks. It was a very strict diet, no doubt, but it was only 5 weeks. I started my less-strict diet since the beginning of the challenge, so I’ve been on it for a third of a year. For somebody who absolutely adores food, that requires a lot of willpower. When Paul tells me that he just finished eating 4-5 slices of pizza, I get hungry and jealous, but I also get mad because I’m craving those foods so much. And so whenever I see Paul gain weight, I get that feeling of schadenfreude. I lost 5 pounds in the past 14 days (I was 190.6 on Sept. 2nd) which is pretty good (especially considering that I’m lighter now), but am still below the pace that is required in order for me to make the challenge. There are only 4 days left in the challenge and I still have 2.8 more pounds to lose. However, I actually have to lose more than that due to the fact that during the final weigh-in, I have to wear the exact same clothes as during the first weigh in (which are heavier), as well as my camera. I’m estimating that I’ll need a cushion of 2 pounds to be safe. So, that’s roughly 4.8 pounds (1.2 pounds a day) that I need to lose in the next 4 days. That’s a fair bit considering that I am starting to get down there in weight. Paul is finally back in the red, actually managing to get behind the minimum pace. 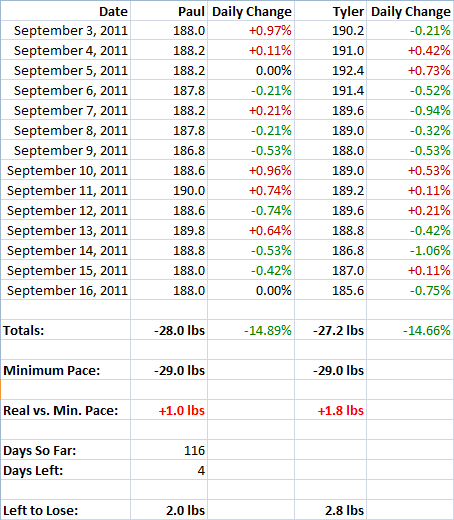 In my last update only 14 days ago, he was 4.3 pounds ahead of minimum pace. However, he only has 2 pounds to go… or around 4 pounds when you consider his final weigh-in clothes and camera, so I think he’ll make it. However, he will have to work to make it and won’t be able to easily coast his way there like he thought he’d be able to 2 weeks ago. I’ve been continuing to do my ‘daily list’ which consists of: walking for 26-minutes (2.3KM or 1.5 miles), playing badminton twice a week, eating 4 servings of fruits and vegetables, drinking 3 glasses of water, being banned from restaurants/fast food/high calorie foods/juice/pop/etc., 12 push-up’s, and 36 crunches. In addition to my ‘daily list’, in order to expedite my progress in this weight loss challenge, I’ve also been occasionally going for my ‘long walks’ around once every 4-5 days. 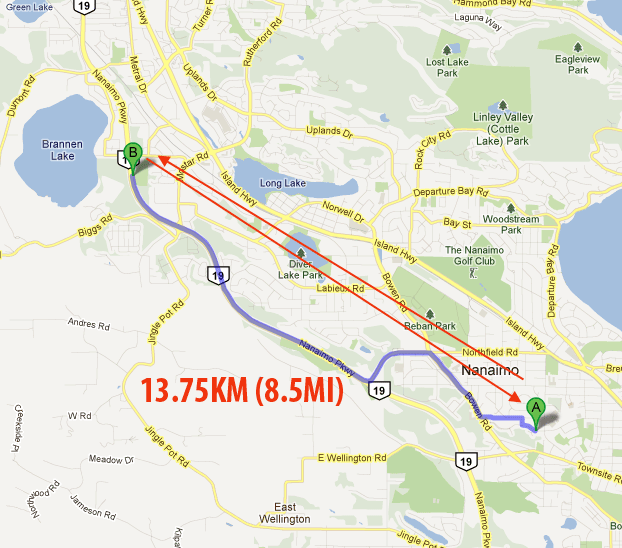 I’ve been slowly incrementing the distance by 0.25 KM each time I go so as to not shock my system. By the time I return home, my feet are ridiculously sore. There are a lot of hills in it too. Diet-wise, I could be doing more. I’m a little bit behind with my water and vegetables, and have still been eating a bit too much for my late dinners and snacks. Anyway, I’m 27.2 pounds down with 2.8 more to go. Can I lose 2.8 pounds in 4 days? It’s not as easy as it may seem, especially since I’ve lost a fair bit in the past week and so I’m due for a small gain again based on my past trends. As I mentioned earlier, Paul more or less fell off the wagon during the past couple of weeks. He started by maintaining his current weight, but then got into eating a lot of high-calorie fast food. He is the exact same weight today as he was 13 days ago, which is a big change in momentum when you consider the pace he used to be on. However, even though Paul’s progress has had a bit of a setback, he lost so much weight earlier on in the competition that he hasn’t dug himself too much of a hole that he can’t crawl out of it. If Paul focuses on the challenge again, he should be able to make it. After all, he only has 2 more pounds to go. But if he continues to indulge in all the foods I wish I could have right now, there’s no way he’ll make it. In my last few weight loss contest updates, I included polls to see what you guys thought would happen in this challenge. I’ll post the results of this epic weight loss challenge in about a week from now, so be sure to check back! Starving in the last 4 days and you manage weight loss .. You are close now. Looks like your long strategy paid off more than Paul’s short term one. Good luck the rest of the way in these four days..
Well done on losing the weight Tyler. You can easily lose the last few pounds. Just eat right and exercise more for the last few days, then on the day of the weigh-in go to a sauna! Weight loss (in water) is counts! I think you guys can make it. keep up the good work and if I was in a challenge I wouldn’t feel bad for my opponent at any time. It is game on in my book. What happened did you make it or non of you won? Definitely keen to find out who won. I’m sure you both starved it out till the checkered flag dropped! I vote for both of you.. Keep updating the wight loss challenger. Wow, you guys are playing for high stakes. Funny that Paul was paying about the same amount monthly with the injections that he would have to pay if he lost the challenge. what happened to your game? It seems you’ve lost interest in this blog and I was curious if you’d be willing sell it. I can offer you $50 and half a jar of pasta sauce (it’s quite excellent pasta sauce). This month you have posted 1 business / web related post (On the 17th) – As you called it, a quick post. I have been reading this since you started but there doesn’t seem to be much relevant content and a lot of weight loss and paid ad posts. What would you put this blog under now? Weight loss? Business? Personal? Advertising? This used to be one of the first sites I went to online but the content has changed so much. 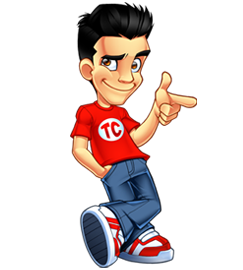 When did you last talk about one of your sites, what you are doing for work, profits, events in the industry etc. This sounds very bad but I am trying to give constructive criticism because I have stopped checking it often and have seen a lot of others saying the same. I really hope there will be more business posts, I also reallyed liked the personal posts about how working online has improved your life I.E. buying the condo, items you got from online pay…enspiring things…things that people can look at and think that is a goal. The weight loss…I don’t see what it is for on this blog? I know this is fake, but this comment made me LOL very very hard! It was indeed fake – removed it. What happened? It’s been seven days since the weight loss challenge was over. Can we get a resume. I want to join the challenge. Most of home base workers/ online workers have the same problem in weight. You drive a hard bargain, Mr. Cruz. Here’s what I’ll do to sweeten the offer. In exchange for this site I can only offer $40 cash now but I’ll still give you the excellent half jar of pizza sauce PLUS I’ll throw in some old copies of Flava Men and JustUsBoys. Well done, although tut tut on the victory meal!